I switch between a HiDPI display and a normal display pretty regularly and as part of that, I switch my font DPI quite often. I haven't had problems in Gnome with changing display scaling, but when I change the font DPI instead in XFCE, the titlebar font size doesn't change. 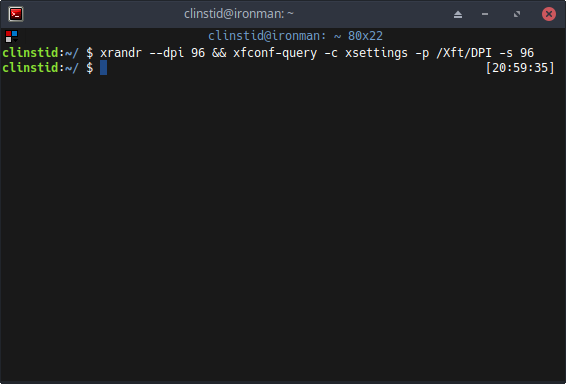 I set the font DPI for GTK apps to 192 for HiDPI and 96 for normal using XFCE's appearance settings (from command line through xfconf-query). 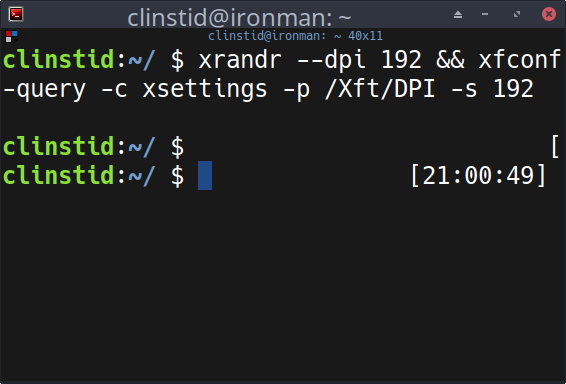 I also set dpi via xrandr to the same values. The changes affect the actual terminal font immediately, but they don't seem to affect the font in the titlebar at all, even when fully restarting terminator. I would love it if the titlebar font would scale along with the terminal font on DPI and scaling changes. I'll attach some screenshots to show what I mean. Note: This originated as a question <https://answers.launchpad.net/terminator/+question/661805> and as I already stated there, I don't have a clue with this one. So I'm throwing this out to the self-interest and knowledge of everyone else. I'm going to dive into the source next week and play around, see if I can get some more information or perhaps get it to work. This also happens for me when I scale the font in GNOME 3 on Ubuntu 17.10.1.